If you’re anything like me, this curry may well become a firm favourite in your recipe repertoire as soon as you’ve taken the first bite. It’s a bowl of pure, wholesome, warming goodness. It really is worth using fresh tomatoes if you can find ripe ones. 1. In a heavy-bottomed saucepan, heat the oil on a medium heat, then add the onion and cook to soften. Grate the ginger and chop the garlic. Turn down the heat to low, then stir the ginger and garlic into the onion and cook for another minute or so. Add the dry spices and salt, and cook for a further 30 seconds. Add the chopped tomatoes and the stock, then cook for 10 minutes, uncovered, stirring regularly to break down the tomatoes with the back of the spoon. 2. 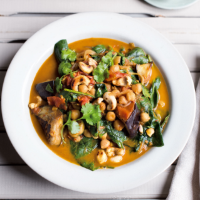 Once the tomatoes have cooked down and reduced a little to make a sauce, add the aubergine cubes, cashews and chickpeas. Stir well to coat them with the tomatoes, then cover and cook again, still over a low heat, for another 10-12 minutes until soft. You may need to add some water if it looks a little too thick. Stir occasionally to stop it catching on the bottom. 3. Finally, add the coriander stalks and spinach leaves, and cook for a couple of minutes, until they have wilted. Taste and check for seasoning. 4. Serve half of the curry topped with half the coriander leaves and a squeeze of lime juice. Leave the other half to cool before refrigerating. Serve the leftovers for lunch with seasonal greens. Recipe taken from Nourish & Glow: The 10 - Day Plan by Amelia Freer. Penguin Random House, 2017.